Solana Beach, CA- Baja “Directions,” Inc. is pleased to announce notable updates to four of its six popular Southern California Series of fishing charts and guides: Santa Catalina/San Clemente Island, San Diego/Mission Bay, San Diego Offshore Banks and Los Angeles/Orange County Offshore Banks. These new maps utilize the latest bathymetric data available from NOAA, giving the charts the most accurate and detailed view of the ocean floor to-date. New features include increased area coverage, the most comprehensive list of GPS numbers and local fishing areas ever published by Baja “Directions,” and a full-color fish identification chart that gives tips on how to differentiate between like species. The company also updated its unique “Tips & Techniques” section, which shares proven fish-catching tactics used by industry experts. “These [new] charts were built to not only get the user to the fish, but also get him home safe in case of electronics failure,” says Dirk Swierczynski, owner of Baja “Directions” and an avid fisherman. In tinkering with the most popular fishing charts in Southern California, Dirk hoped to enhance the functionality of his products, making them a viable safety tool for the private boater who has become increasingly reliant on electronic navigational equipment. 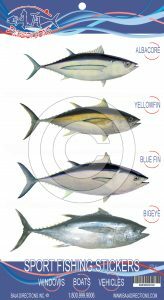 The new and improved Southern California Series charts contain all the necessary information to navigate safely back to port by compass from all popular fishing locations offshore of San Diego, Los Angeles and Orange Counties. Baja “Directions,” Inc. has been developing fishing chart products of the Southern California Bight and Baja California since 1997. The revolutionary Baja Series of charts and guides were introduced into the retail market in 1999 and were an instant success due to their emphasis on passing along local knowledge to the traveling angler. Features of the Baja Series include a full-color 3-D representation of both sea and land, marked fishing hot spots with GPS locations, fishing tips and techniques from regional experts, a seasonal fish calendar, a species identification chart, an English/Spanish phrase translation of common fishing terms, and a facilities guide. The titles of the complete line of Baja “Directions,” Inc. charts and guides for 2005 are listed below. All of the Southern California Series charts are available in the best-selling laminated version, as well as the popular folded waterproof version. The Baja Series products are only available in the folded waterproof version. For more information about Baja “Directions” products call 1-800-999-9006 or go to www.bajadirections.com.